“It keeps getting better with time” – That lyric from Madd Hoss Jackson’s latest album really seems to encapsulate what the band has been up to lately. Through a steady dose of touring and good old fashioned values, along with playing an amazing array of shows and venues, Madd Hoss Jackson’s fan base has been growing at an impressive rate all over the Midwest. Whether it be a small town bar or an opening slot for a national act, a 50th wedding anniversary party or a wild college club, Madd Hoss Jackson knows just how to connect with any crowd. Their uncanny ability to change styles and instrumentation to make every song sound like it is one of their own has become a trademark of the band. 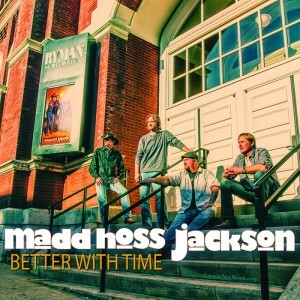 Armed with the new album which was produced and engineered by some of Nashville’s best music industry veterans, Madd Hoss Jackson continues to branch out to new markets such as Minnesota, Indiana and Tennessee, bringing their music to the ears of new fans all the time. To round out their ever growing resume, Madd Hoss Jackson has had the opportunity to share the stage with many current and classic artists including the likes of Eric Church, Montgomery Gentry, the Charlie Daniels Band, Jake Owen, Hunter Hayes, the Kentucky Headhunters, Blackberry Smoke, Jerrod Niemann, Confederate Railroad and .38 Special, just to name a few. Madd Hoss Jackson is made up of four hard-working, hard-playing guys who pride themselves on being family oriented first and foremost. Musicians include Matt Bullard on guitars and vocals, Andy Ham on guitars, fiddle, bass and vocals, Mark Behymer on bass, keyboards and vocals, and Jim Jennings on drums and vocals. If you’ve been searching for a band that is as unique as it’s name, look no further than Madd Hoss Jackson.